Certainly you’re saying to yourself “Um…why would you bothered or alarmed by this? 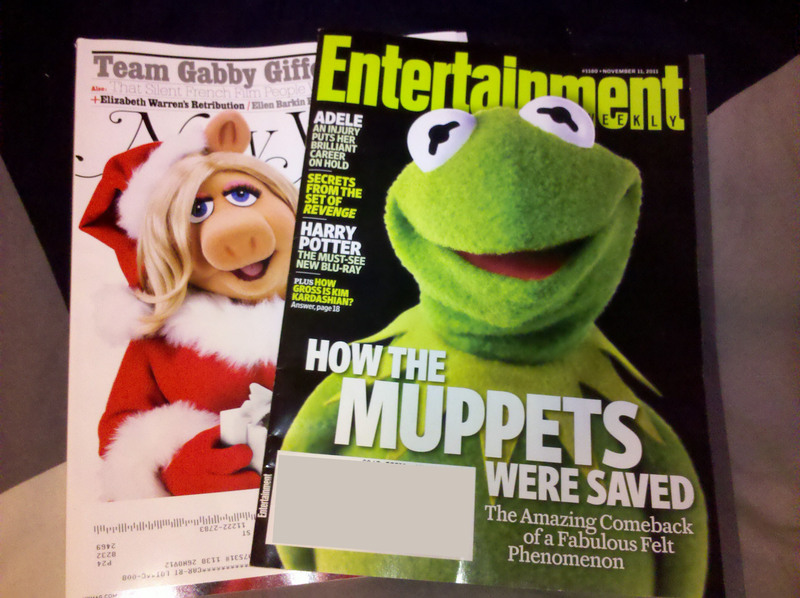 Shouldn’t you be over the moon that the Muppets are on the cover of not one but two pretty big magazines? That they’ve catapulted back to the forefront of the pop culture consciousness?” And, in a vacuum, you’d be right. We’d love nothing more than the Muppets to steal back a share of the zeitgeist from the Lightning McQueens, and the Harry Potters, and the Bellas, and the Biebers. But our overwhelming notion these last few months is that it’s too much too soon. Let’s not overhype this; let’s just be happy to have a chance at redemption. Let’s not give the backlash machine – bloggers, critics, Facebook statuses – the chance to pile on barbs and disapproval even before the film comes out. If, when it’s released on Wednesday, The Muppets is excellent and becomes a hit, then by all means let’s celebrate it. Let’s make Kermit Time magazine’s Man of the Year, let’s have Fozzie Bear replace Regis, let’s indeed have the Muppets host the Oscars (or at least co-host with the ever increasingly Muppet Billy Crystal). But, until then, let’s reserve judgement, contain our enthusiasm, and not count any magazine covers before their hatched. The good news is that the early returns have been overwhelmingly positive, and our fears might have been for naught, wholly unnecessary fretting. Then again, we can’t seem to get past the fact that Frank Oz – the voice of Ms. Piggy and Fozzie Bear, and Jim Henson’s closest collaborator – refused to participate in the film, and has distanced himself from it. If he finds Segel’s vision inappropriate, his tone incongruous, then how could the film possibly pay tribute to Henson? Could Segel be more in tune with Henson’s spirit than Henson’s right-hand (no pun intended) man? Or could this perhaps be a case of an older, jaded, out-of-touch and maybe even resentful puppeteer presenting opposition out of spite, bitter that he was not tasked with ushering the Muppets out of obscurity? That could very well be true, that for Oz it was all or nothing. Either he would carry the Muppet torch by himself or he’d stay entirely in the dark, no matter how brightly Segel’s creation shone. We’ll find out for sure soon. And with the Muppets numerous appearances in the last week, we’re still on the fence, oscillating between siding with Oz and feeling confident in Segel’s approach. While Oz has apparently decried Fozzie’s accessory of fart shoes in the new movie, Entertainment Weekly‘s feature article on the film astutely points out the Muppets affection for whoopee cushions (approx 02:58), so it would seem that Oz is somewhat off-base, ascribing to revisionist history. Then again, while we enjoyed this segment on last weekend’s “Weekend Update,” we couldn’t help feel that this version of Kermit, joining SNL‘s Seth Meyer’s, was too caustic, too – dare we say it? – snarky. Would the Kermit that was an extension of Jim Henson’s arm ever make a crack about kids being fat in order to set up a sausage-Miss Piggy joke? We don’t think so, and we can’t help but find that dissonance from the warm, gentle Kermit we know so well somewhat disturbing. Listen, we’re not looking for Sesame Street here. We’re not looking for vanilla, innocuous, inoffensive, neutered entertainment. That’s not the Muppets. But neither is cynicism, neither is malice. BUT perhaps that instance is the exception (although, the resentful attitude offered by not just Kermit but also Miss Piggy, Fozzie, Gonzo and Rowlf in Segel’s monologue was also a bit off-putting), as just two nights before Kermit and Piggy joined Jimmy Fallon, Martin Short and Michael Stipe for a game of Password that was about as fun, silly, earnest and Muppets as it gets. So there is hope. And if the Muppets are about anything, it’s hope right? Isn’t that what the Rainbow Connection was all about? The Lovers, the Dreamers, and Us.